(L to R): Lisa Gifford, Jane Espenson and Richard Cutting. 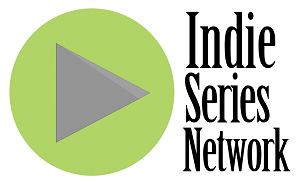 The 5th Annual Indie Series Awards were held on April 2, 2014 at the El Portal Theatre in North Hollywood. Lisa Gifford (3some) and Richard Cutting (Milgram and the Fastwalkers) presented the awards for Best Guest Star - Comedy and Best Guest Star - Drama. 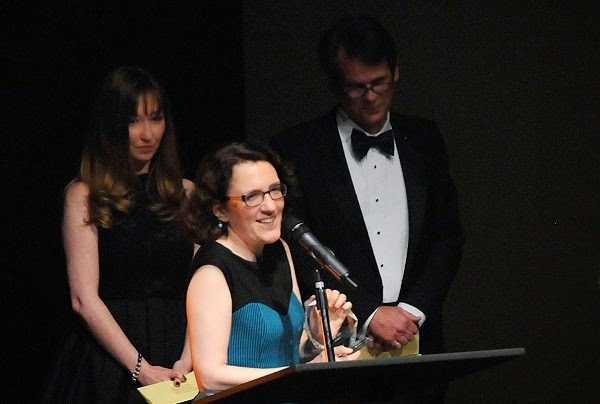 When Amy Acker (Husbands) was announced as the Comedy winner, ISA5 host Carolyn Hennesy (Single Siblings), also nominated, ran on the stage and stole the award! The stage manager and trophy girl Cherish Lee were able to wrestle the award away from Hennesy and give it to Jane Espenson, who accepted on Acker's behalf. Next, Charlene Tilton (DeVanity) wins in the Drama category, and is given the award by Cherish Lee, her daughter.